You SO thought this post was gonna be about that gamer guy who worked at the corner store who asked you for a date on the day after you got dumped by your Fabio. The one who picked you up in his grandma's car, took you to Denny's, ordered for you from the senior menu, proceeded to call you a princess the whole evening, while telling you that your eyes were like the deepest pools in Ashzara. No we're not talking about that kind of cheesy. 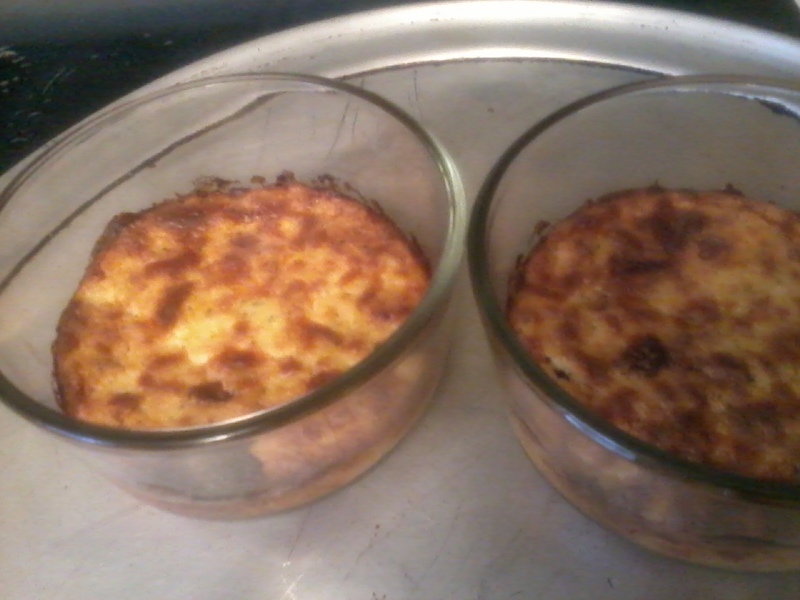 Well, its not quite a recipe, just a loose set of directions that lead to cheesy deliciousness. The original ricotta bake idea has had several permutations, the most famous of which have come via the lovely Shelly over at The World According to Eggface. This is the Waning Woman version! I basically looked into my fridge yesterday, plucked out the choicest pickings, and decided to whip up something low carb and tasty. I threw the following into a bowl and mixed with a spoon until blended. I put the mixture into 6 muffin silicone pan (cause that's all I got ) and let it cook at 350 until it was nice and brown. I had a lot left over, so I put the remaining mixture into these two small glass casserole dishes and this is what you see. Voila! It was sooo good that I actually wish I had more right now. Yum, that sounds and looks delicious! YUM! Im trying it in my new place! LOL okay I thought I saw a WoW refernce with the mindcontrol helmet but now with Ashara. Too funny! @Freejulie @Chrissy I think that I might make this again, but with BACON!! I gotta try this cause both me AND my husband can eat it. He LOVES cheese. I've been feeling like such a horrible wife lately. We never eat together and he cooks his own food. I eat my protein bars and string cheese during the day at work. When I get home, I don't really feel much like eating, and what I do it is piddly compared to him. I don't cook anymore...at all. He does the cooking. Is that horrible? I really do feel bad. Maybe he and I can make this together.